If you are a lender looking for real estate services in the Boston area, contact the attorneys at Pulgini & Norton. We have nearly 40 years of combined experience handling lenders' concerns and an in-depth knowledge of legal and financial issues. We serve as title agents to Stewart Title Company, Land America Title Company, Chicago Title Insurance Company, and First American Title Insurance Company. Our attorneys are dedicated to providing cost-effective results. As a lender, you want to identify and eliminate risks associated with title and lending, so that you can feel secure about your mortgage investments. Our attorneys are experienced in residential real estate conveyances. We can facilitate all of the steps of a mortgage transaction and make sure that there is a smooth progression from the initial title examination to the final closing statement. As a lender, you want to make sure that the seller is conveying good, clear, and marketable title, which is transferred free of defects, liens, and the possibility of litigation. We can conduct a comprehensive title examination that covers the title history of the property for the past 50 years, including mortgages, easements, mechanics' liens, tax liens, and any other possible issues. If there is a defect, we can potentially help resolve it. Some of the complex problems we may be able to resolve include probate issues, incorrect legal descriptions, improper foreclosures, tax liens, and missing ownership interests. We can also coordinate the issuance of title insurance to you and the buyer, and we can prepare and deliver the documents that must be signed at the closing, including the promissory note, the mortgage, the HUD-1 Settlement Statement, and truth in lender disclosures. We coordinate with the seller to receive the deed, the smoke detector certificates, and in the case of a condominium the 6(d) certificate. We also handle the funding of the mortgage escrow account, the payment and allocation of real estate taxes, the payment of realtor commissions, the distribution of sales proceeds, and the necessary certifications. 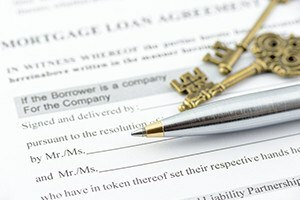 Our attorneys can also help with foreclosures as necessary. In Massachusetts, this process is governed by Massachusetts General Laws, Chapter 244. Lenders can foreclose through a judicial or non-judicial process. In a non-judicial foreclosure, a foreclosing lender has to provide a notice of default and right to cure, as well as a notice of sale, to the borrower in default. The notice of default and right to cure has traditionally given the borrower 150 days to cure the default, although this period could be reduced when a lender tries in good faith to negotiate over the phone or in person an alternative to foreclosure with the defaulting borrower, but is not able to resolve the dispute. In 2016, a 90-day right to cure law will replace the 150-day period. The notice of sale must be mailed to the defaulting borrower at least 14 days before the sale date. The notice of sale should also be published once a week for three consecutive weeks. Borrowers who take out a high-cost home loan have added protections under the law. When the law is violated, the borrower can rescind the loan and use this rescission to defend against a lender's foreclosure. Accordingly, it is important for lenders to retain attorneys who understand the special rules affecting high cost home loans. The lawyers at Pulgini & Norton can counsel Boston lenders on mortgages as well as foreclosures and other real estate matters. We also serve clients in Braintree, Malden, Cambridge, and other cities in Massachusetts. Call us at 781-843-2200 or contact us via our online form for a free consultation.